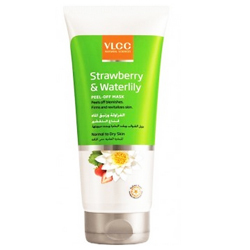 Buy VLCC Strawberry & Waterlily Peel Off Mask Peels off blemishes. Firms and revitalizes skin. This illuminating peel-off mask is specially formulated to give skin a glowing, youthful and healthy looking complexion. Strawberry, a natural peeling agent exfoliates dead cells, reduces pores and firms skin. It also reduces pigmentation and makes skin visibly brighter. Waterlily revitalizes ageing skin giving it intense moisturisation, thus leaving it soft and refreshed. Apply appropriate amount over cleansed face and neck avoiding area around eyes. Allow it to dry for 10-15 minutes. To remove, peel-off from the forhead line towards downward direction. Rinse-off and pat dry. In case of contact with eyes, rinse with water. use pnce or twice a week. Do not apply on broken or inflamed skin. For optimal results, use in combination with Cacti & Litchi Gentle Hydrating Face Wash and Frangipani & Oatmeal Gentle Exfoliaing Scrub. Strawberry, Waterlily, Aloe Vera and Orange Oil.